ICMA is excited to collaborate with Stanford Jazz Festival and invites you to join us for Indian Jazz Journey - a unique cross-pollinated, multi-generational jazz with one of India’s most treasured vocalists. 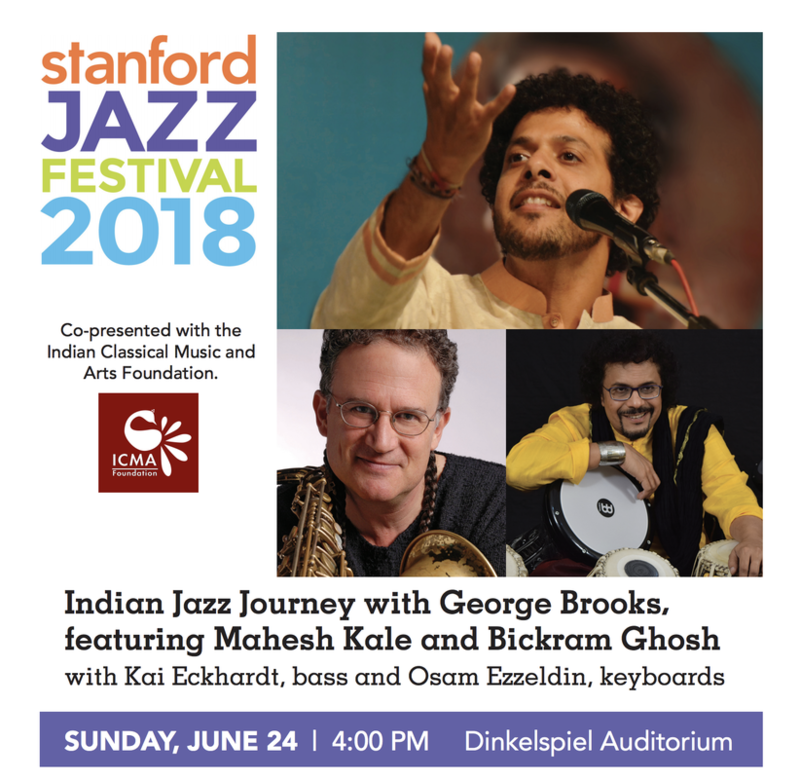 Continuing their sold-out collaboration of last year’s Stanford Jazz Festival, jazz virtuoso George Brooks and Indian classical music star Mahesh Kale reunite for a performance that transcends cultural and musical barriers. Featuring renowned Indian percussionist Bickram Ghosh, this performance of otherworldly sounds creates an intriguing blend of jazz energy and Indian ragas and rhythms. Mahesh is a phenomenon around the world, beloved for his enchanting, soaring voice and his unique ability to interweave classical and popular music. Saxophonist George Brooks has a colossal tone, intuitive creative leaps, and a commanding technique. The go-to horn-master for blues giants like Etta James and Albert Collins, he helped to create the electrifying genre of Indian/jazz fusion with world-class virtuosi such as Zakir Hussain, John McLaughlin, and the late Larry Coryell. Together, Mahesh, George, Bickram, and their world-class rhythm section of bassist Kai Eckhardt and keyboardist Osam Ezzeldin, will conjure otherworldly sounds steeped in Indian ragas and rhythms, creating an intriguing blend of jazz energy and Indian traditions. We have a last minute change and are excited to welcome Kala Ramnath to Indian Jazz Journey this year! A 2017 recipient of the prestigious Sangeet Natak Academy award— the highest award to which a Hindustani classical musician can aspire—for her contributions to the violin in Hindustani Classical Music — Kala-ji will be taking Mahesh Kale’s place at IJJ, with her captivating violin and vocals. She is also a world-renowned master of Carnatic music, and has numerous collaborations and fusion projects to her name; no matter the format, her performances are thrilling events. “If Mozart had been transported to the South Asian subcontinent, this is what he and improvised Western classical music might have sounded like,” said Jazzwise magazine. Tickets are sold through Stanford Tickets Office. Seats are pre-assigned so book your tickets soon! AFTER CLICKING THE BUTTON BELOW, MAKE SURE TO ENTER PROMO CODE "ICMA18" IN TOP RIGHT CORNER OF THE PAGE BEFORE PURCHASING RESERVED SECTION TICKETS.